There will only be 3 WEVents held this year. 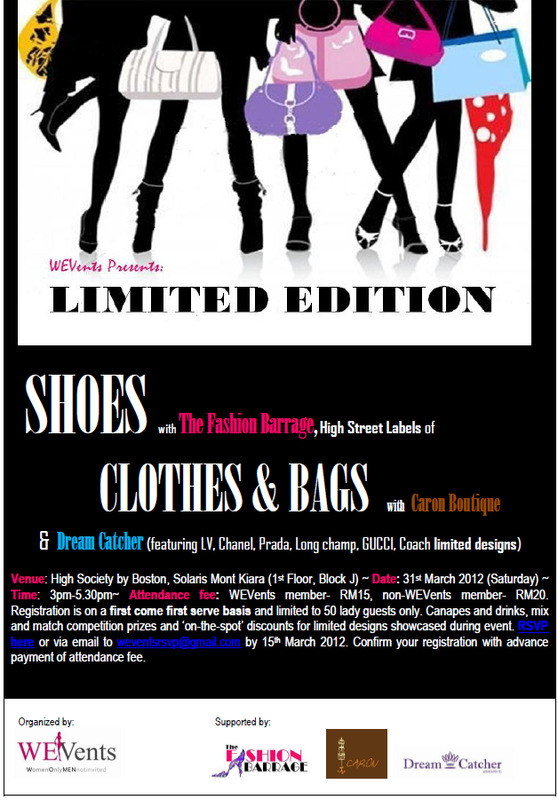 Join us for the first WEVents to be held this year on ‘Limited Edition’ shoes, bags and clothes with Fashion Barrage, Caron Boutique and Dream Catcher. RSVP only open for 50pax.There will be a mix-and-match competition where 10 volunteers will be selected on the spot to participate. The winner of the competition will walk away with the attire FREE and the rest of the 9 participants will get 50% discount vouchers, on top of the other cash vouchers and discounts provided by the sponsors.